Parenting the Strong-Willed Child is a book on how to help children be obedient who are otherwise difficult to get to comply. 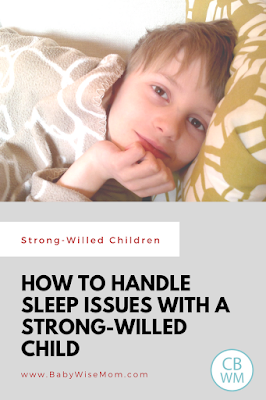 The authors, Forehand and Long, include a short section on sleep for the Strong-Willed child. They point out that it is hard for a child to establish consistent wake and sleep cycles unless things are consistent with bedtime and waketime (page 229). They suggest you have a ritual of 10-20 minutes in the same order. They caution to not eliminate the nap prior to age four. They really encourage parents to teach children to sleep on their own early in life. The authors say they have met with many teens and pre-teens who still need a parent to fall asleep (page 234). They say if you want a child to know how to sleep on his own, teach him early in life. If your child comes out of bed, they suggest you take him back to bed without words and without anger. Once he is in bed, firmly tell him to stay there (page 232). Sometimes children get scared at night. Use imagination to your advantage. Tell your child “It’s my job to keep monsters out of this house.” We have used that one before! You can also create a monster repellent. They suggest an air freshner with a paper taped over it and an X on the front over a picture of a monster. Some parents use a squirt bottle with glitter inside–use your imagination! These are all simple topics that can really have a lot of discussion on their own (see related posts below for more discussion). Sleep is important for any child, and it is always important for good behavior–even for adults! Even adults are nicer when they have enough sleep. These simple admonitions will help your child to sleep well: sleep on her own, have consistent bedtimes and waketimes, have nap for as long as your child NEEDS it not WANTS it, handle attempts to get out of sleep quickly and firmly, and address fear. These are tips that are helpful for any child! Don't think that my 19 month old would fit into this category just yet but he is for sure strong willed. Do you have any suggestions or did you deal with sleep regression with your kiddos at all? My LO screams every night when I lay him down and he wakes up during the night at least once screaming. It's strange and he's been doing it for at least 8 weeks now. I always let him CIO but I thought by now he would get it. Please, any help is greatly appreciated. I have implemented Babywise since LO was born. Thanks. Hello,This is OT, but could you do a post on your after dinner family devotions time. You already mentioned the complimenting, but what else do you do? How long does it take? What if one of you has a commitment after dinner, etc.Thanks so much! Brandonik, whenever there is a sudden sleep regression, I always check on the child. It is usually due to sickness or possibly nightmares. So I would go in and assess the situation. If I can't find anything wrong (or if I can and once things are taken care of), I tell the child it is time to sleep and to go back to sleep. MHOA, we try hard to not have one of us having to leave the home between dinner and kids being in bed. Sometimes it happens, obviously. But we do our best to schedule things after bedtime if possible. Once kids are in PJs and ready for bed (we also do clean-up), we read scriptures, then do complimnets, then prayer. It prbably all takes about 20 ish minutes I would guess? I don't watch the clock. I will pay attention and see if it is vastly different from that.